Great in the beginning but after a few years it wears down. Its has done it's purpose so far but as time has gone by (4years) the elastic that holds the fabric to the seat has stretched and no longer holds it down and like a few others have said there is minimal padding. With our next child we will go with something different. Not sure I would buy another one. I feel it is very safe but I find it impossible to take apart to put through the wash to keep it clean. I do not like my grand babies riding in a dirty car seat and you can sponge it so much. Decent, but not for long car rides. I really like the Safety 1st brand. I bought this carseat because of the attached base that comes with it and the intro to seat belt when my baby gets old enough. As I opened the box and pulled the carseat out, I noticed there was hardly any padding for my 7m old to sit on. It felt like he was just sitting on hard plastic. For a car seat that's supposed to grow with him, the padding should be something worth investing in. We luckily got a refund and bought a Cosco convertible that has much, much more padding and will last until he grows out of it. My son has used this car seat since he was 1. He's not 4 and still fits in the car seat great! Bought another one for our second vehicle! Plan on buying another for our next child also! My daughter has used the All-in-One for over 4 years. From rear facing to forward facing to now a belt positioning booster. It has held up very well over the years. 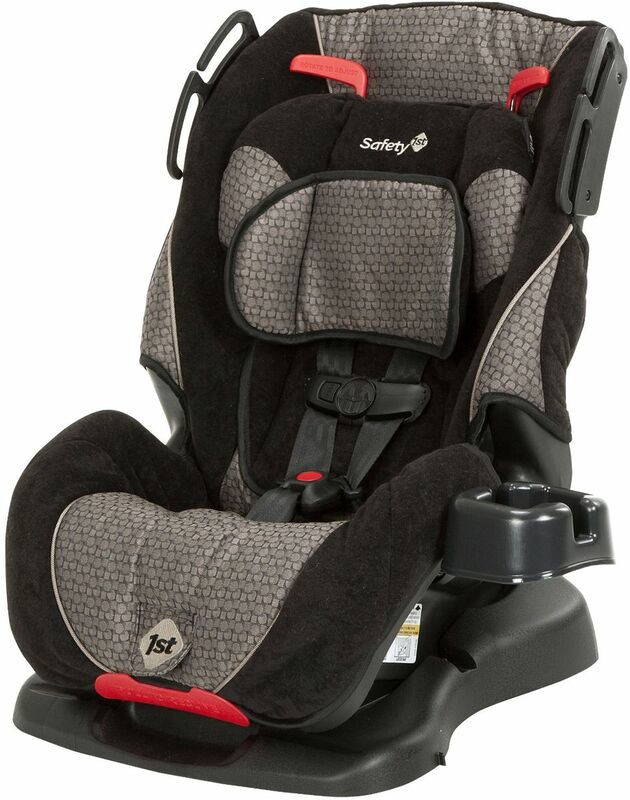 We are now looking to buy another Saftey First booster seat because some little girl is jealous her baby brother has 2 new Saftey 1st car seats for in our car and grandma's. My children's saftey is top priority and that's why we choose Safety 1st. At first this is a very nice car seat, however after having it for 2 years the padding is completely flat and i have to use a pair of pliers to compress the tensioner release on the anchor strap. It has been our backup car seat seat since the padding wore out but i think we will not be using it with our second son. It has not lasted as long as i would like for the money spent. THANK YOU! Kept my baby safe! We were in a horrible accident.....horrible. Our car is completely totaled and. Our baby had not a scratch nothing wrong. Thank you to Safety first manufacturer the whole team. We feel so blessed and thankful. Our replacement car seat will be the same. Thank you. It's a very short lived car seat for bigger children that you want to extend rear face with. My son is only 8months old & is going to outgrow it rear facing. Not good at all. Also when installed at the farther recline while rear facing the passenger seat has to be all the way forward. So it's not very compact either. All in all it's short lived & bulky. I'd much rather have had the Extend2Fit. Bought this car seat because of the ease of installation and that it would last awhile. After installing the car seat, my son seemed to like it; but after a couple of weeks, I noticed he would fuss more then ever. My husband and I exchanged car seats (the other car seat is safety first 65 sport) and no more fussing. My baby looks comfortable on the chair. It is light, strong and easy to use. My only comment is that I think it not reclines enough, so the baby's head falls over her chest more then I would like, but is easy to sit my baby on the chair and she never cry or feel unconfortable when I put the seat belt on her. It doesn't recline for forward facing and my sons head always falls forward when he sleeps. Also its very difficult to adjust the harness tension. Purchased this for my son and I love it! I purchased this car seat because it was a great deal for what you get. It is a rear facing seat, forward facing with a 5 point harness and a high backed booster all in one. When I purchased it I had originally planned to keep my son rear facing. It is pretty impossible to do if you have a small car though. That was my only issue with this seat. I haven't had any other problems. My son is very comfortable in it. I have it a 4 star rating because of how hard it is to do rear facing in a small car. Otherwise I would have given it 5 stars. Not good for younger children. My son's head very far down when he slept. The seat wouldn't layback far enough, like an infant seat should & it said it was good for like 5#+ or something like that. And now that he's 19 months the straps cut into his neck, I had to add strap covers to prevent them from hurting him. The cupholder on the side thankfully is removable, when I had my younger son and moved the car seat to the side of the car I couldn't shut the door with it attached. I love this car seat, but now that my son is 2yrs old its hard for him to sleep. His head is always hanging to the side, but its great for babies & olders kids.. This product does not work, it has been a nightmare for my son, each time he falls asleep, his head goes down and side way. In short it does not provide support for a now 18 monthso old child. Wouldn't buy it again. Only regret is now I have to look for money to buy another car seat. I've used this seat for both uses, rear facing and forward facing. Forward facing was a little easier install, but rear facing was especially difficult. It made a good seat once it was in properly, just a huge hassle when switching from one car to the next. This is the best car seat i owned and my daughter loves it. Designed for your growing child, the All-in-One Convertible Car Seat by Safety 1st will take your little one all the way through three different stages: starting as a rear-facing infant car seat, converting to a forward-facing car seat, and then transitioning to a belt-positioning booster car seat when your child is ready. The car seat features our QuickFit™ Harness System that easily adjusts harness height right from the front in just one easy step. With a removable cup holder to store a drink or snack, your little one will be sure to love this car seat as much as you do!